Though there are many species in Buprestidae (commonly known as Jewel Beetle), what Japanese people associate with them would be Chrysochroa fulgidissima. The shape is slender elongated ovoid, wholly colored with glossy green, and has vertical stripes on the back which composed of iridescent green and red, that are the reason why they are popular as beautiful insects. According to a theory, their colors dazzle the predators (such as birds) by reflecting sunshine. The imagoes often fly around broadleaf trees such as hackberries, zelkovas, in the daytime, to feed on the leaves of which (the plants classified as Ulmaceae). The larvae live inside of dead trees to feed on the wood. 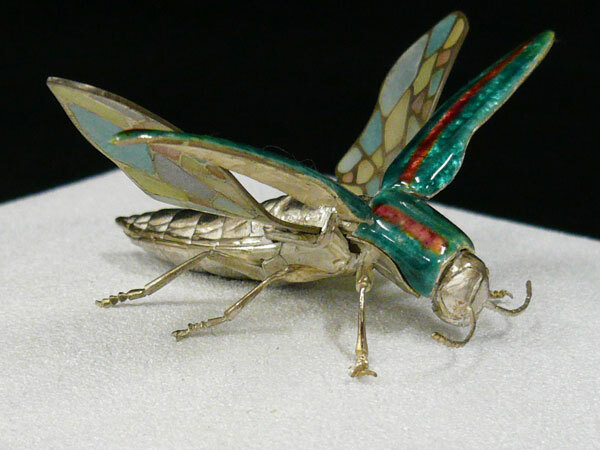 The elytrae (the hardened forewings), seem green at first glance, yet which changes as the angle of view changes, thus is not appeared by the change of the pigments in the exoskeleton, is caused by multiple reflections from multi-layered, semi-transparent surfaces which phase shift and interference of the reflections modulates the incident light by amplifying or attenuating light frequencies, therefore “Tamamushi-Iro (the color of Jewel Beetle)“ is not a single color such as blue, red… that has to contain the hue changes. Thus are not easily to depict in artificial way, in spite of that, there are some documents recorded the trial that used green and purple silk threads for the warp and weft, that enabled the different color emerging from the textiles as the angle of view changes. Due to their beauty, the elytrae have been traditionally used in handicrafts and decorations, such as “Tamamushi no Zushi” owned by Horyu-ji temple in Nara, Japan, that recently revived with 2 different types: “The Reproduced Type” which is depicting the appearance of the original used to be, with the Buddhistic lacquer painting on the pedestal part, and the decollation under the metal fittings that consists of 6600 pieces of Jewel Beetles’ elytrae ; and New Type (called “Heisei Type”) is an art work decollated with Taka Maki-e (Japanese lacquer decollation sprinkled with gold or silver powder), and 36000 pieces of Jewel Beetles’ elytrae. As an example of the rare species in Buprestidae, I would refer to the larvae of Melanophila, that only inhabit and glow inside of the trees collapsed by fire, therefore the female imagoes detect wildfires even that is 50 km far away, and fly over the distance to lay eggs.